Many workplaces are looking at options for social collaboration. The idea is to harness the power of social networks as an internal communication and collaboration tool. While there are some powerful and full featured options in this space, a new iOS and Android app called Pride aims to provide the core benefits of social networks in a free service that’s extremely easy to set up, manage, and use. More importantly, Pride delivers a fun and playful experience that is likely to encourage employees to use it while delivering some very tangible business benefits. Pride was created by mobile and social enterprise startup DoubleDutch, a company that delivers mobile CRM and event management solutions. The company’s approach is all about using mobile technology to engage with key partners – customers, clients, sales staff, event attendees, and pretty much anyone else involved in a business. That shows through in Pride as well as the companies other products. Social and mobile engagement is easily becoming a key buzzword across many industries and you can see that DoubleDutch succeeds in those areas by looking at its client lists, which include companies like HP, CDW, Cisco, Gannett, and Lowes. DoubleDutch developed Pride first as an internal solution for its own business teams. As you might expect from a startup focused on social and mobile engagement, Pride is designed to make interactions fast, easy, and personal. It allows a businesses or workgroups to create users, identify customers and clients, add locations such as offices or events, and create projects. Pride uses this library of information along with location services to make it easy for employees to check-in at different places, events, meetings, or projects. Like other social tools, it offers activity feeds or timelines for individual users, teams, projects, and so on. 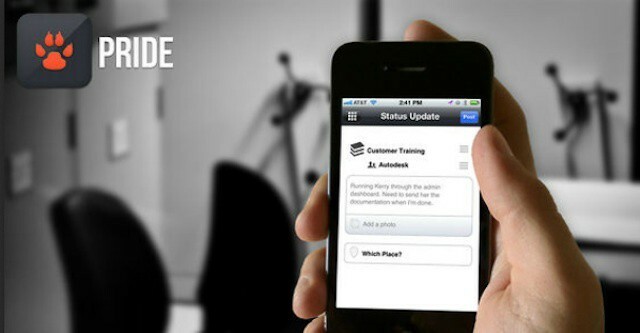 As users check-in and post updates about meetings, customer interactions, and work assignments, Pride delivers that information as a constant stream of progress and status updates. In the process, it encourages business transparency and builds a wealth of data about a business, its teams or workgroups, its successes and challenges, and its overall progress towards various goals. That information can be mined as a source of business intelligence to see where productivity bottlenecks and other issues within a company or project. Pride even offers some gamification features like leader-boards and badges that acknowledge successes by staff members, teams, and contractors. What makes Pride attractive is that it is extremely easy to set up and manage. Create an account, setup users, locations, and such using a simple web-based console, and encourage (or require) employees to download the app from the App Store or Google Play. The entire setup and management process is just a few simple steps. Of course, the free price tag doesn’t hurt either. Because Pride was designed for use at DoubleDutch, it has the feel of a solution for startups. As a result, it will appeal most to small to mid-size companies that want to quickly and easily setup social collaboration but could easily be effective for workgroups or departments in larger companies.